Hanging wallpaper isn’t as scary as you might think! With a little time and patience, you can achieve great results, without hiring a professional. Our guide to hanging wallpaper will explain everything you need to know, from preparation to hanging, and dealing with those tricky bits. 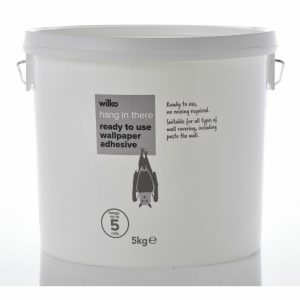 If you haven’t bought what you need yet, check out our great value range of wallpaper and paste. Remember: When undertaking DIY tasks, you must always take your own ability into account and you must also read and follow any packaging and manufacturers’ instructions. This is intended to be a basic guide only and is not a substitute for any professional advice. 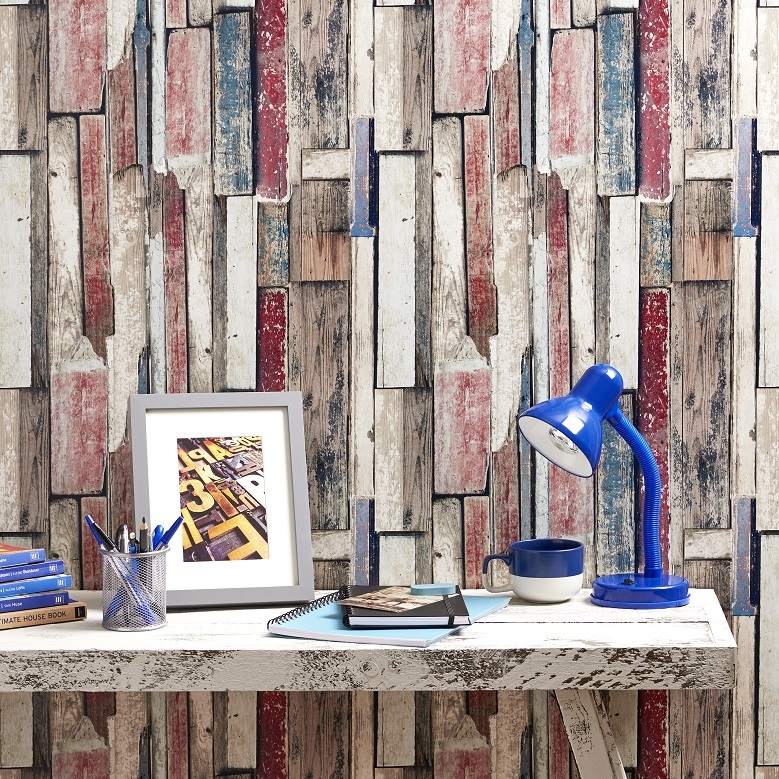 If you’re new to wallpapering, try using a heavy paper. It’s easier to hang than light paper and you don’t have to worry so much about it tearing when it gets wet. Make sure all the rolls you buy have the same batch number, otherwise you might get some slight variations in the colour. Should you use lining paper? 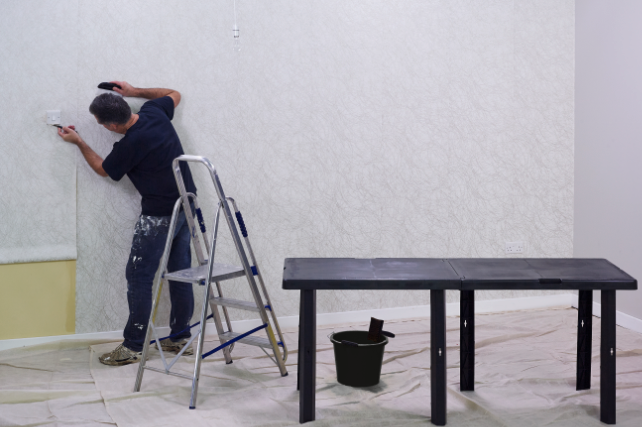 If your wall has imperfections that will show through wallpaper then it’s a good idea to put up lining paper first. Hang your lining paper horizontally so that the joints don’t line up with your wallpaper. If you’re going to paint over lining paper, hang it vertically. 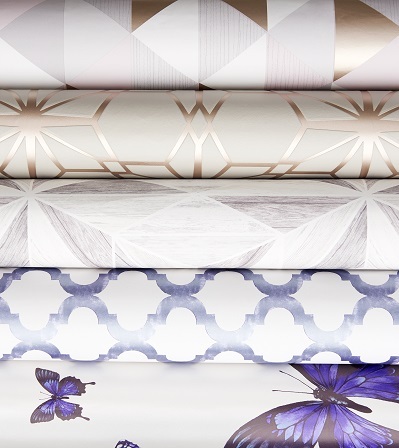 A standard roll of wallpaper is 53cm wide and 10m long. 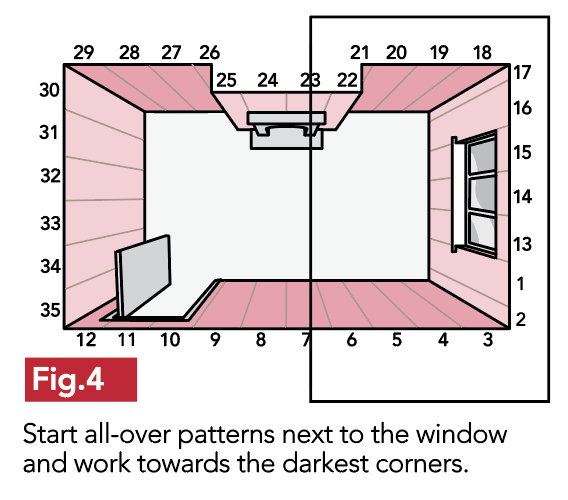 Measure around the perimeter of your room in metres, including the doors and windows. Divide the figure you end up with by 0.53 to find out how many widths you’ll need. Then measure the height of your room and multiply it by the number of widths to find out the total length of paper you’re going to need. Finally, divide the total length by the lengths of your rolls (normally 10m) to get the number of rolls you’re going to need. It’s a good idea to buy a couple of extra rolls just in case. 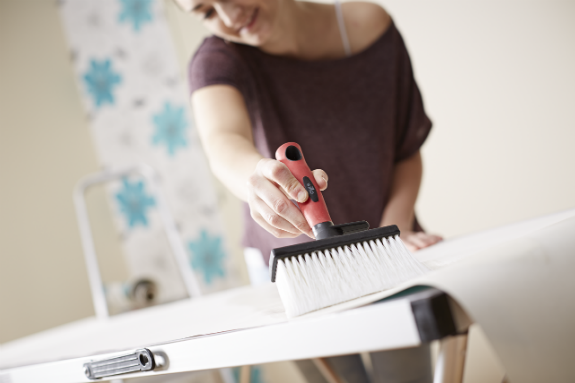 Firstly clean off any loose paint, plaster or old wallpaper and fill any cracks. Then give your walls a good wash down with sugarsoap. If any of your plaster is covered in gloss paint, give it a good rub down with some coarse grit paper. Mix your wallpaper adhesive before you start pasting – making sure you follow the instructions carefully. Using a long spirit level draw a pencil mark horizontally along your wall one roll width down from the ceiling. 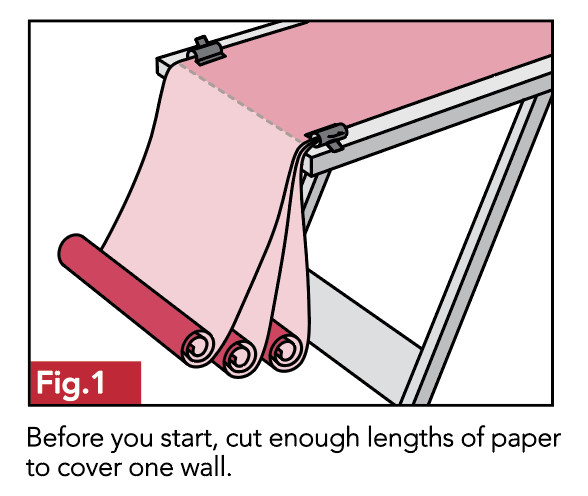 Start by cutting enough lengths of paper to cover your wall. Cut each length around 10cm longer than you need, then place them all rough side up on your pasting table (fig.1). Using a pasting brush apply your paste to the top length, starting at one end and working out from the middle to the edges. 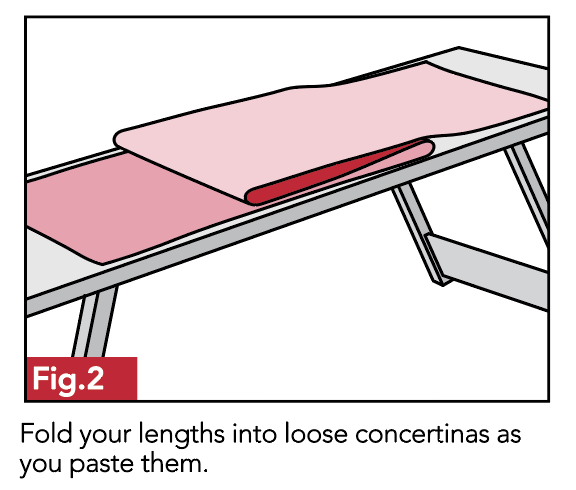 Fold your lengths into loose concertinas as you paste them (fig. 2). Let the paste soak in for as long as the instructions say. Pick up the first concertina by the top edge and, starting in the corner, line up its bottom edge with your pencil line. Use a papering brush to smooth the paper onto your wall. Working from the centre outwards will force out any air bubbles (fig.3). Being careful not to tear it, unfold the concertina as you go along. Tap the paper into the corners with a brush then score a line down the corner of the paper with the back of some scissors. Ease the paper from the wall and trim any excess. Finally, brush it back into place. Keep butting lengths of paper up to the previous one, working your way down the wall. When you reach the bottom trim the last length along the top of your skirting. Leave it to dry for 24 hours. 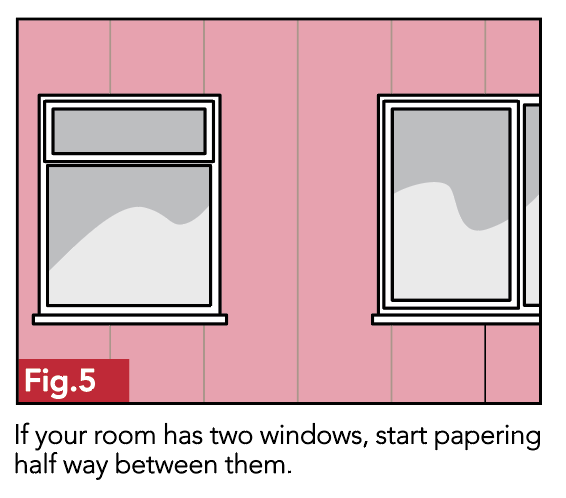 If your wallpaper has any all-over pattern, start at a window and work away from it in both directions towards the darkest corners of your room (fig.4). Wallpaper with large patterns should be centred on the chimney breast – or if your room has two windows, centre it between them (fig.5). Mark a vertical line each side of your windows with a plumb line or spirit level. 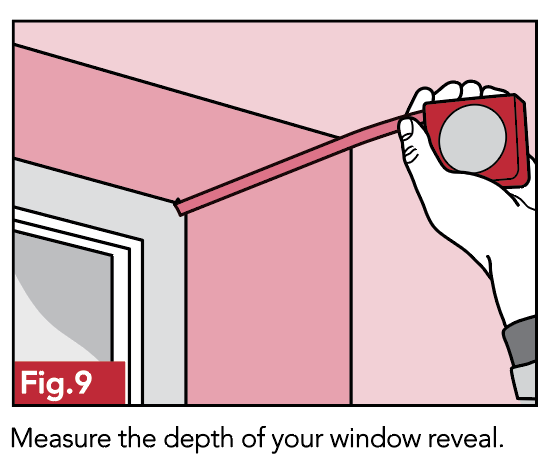 Measure the depth of your window’s reveal and add 20mm for trimming. By taking this measurement away from the width of your roll you’ll get the distance the lines should be from your window. Mark a new plumb line each time you go around a corner. Start unrolling your wallpaper pattern side up. Work out the length of your first piece by measuring from your ceiling to the top of your skirting boards – then add 100mm for trimming (more if your paper has a large pattern). Once you have the length cut and a few pieces ready for hanging – just make sure the pattern matches. 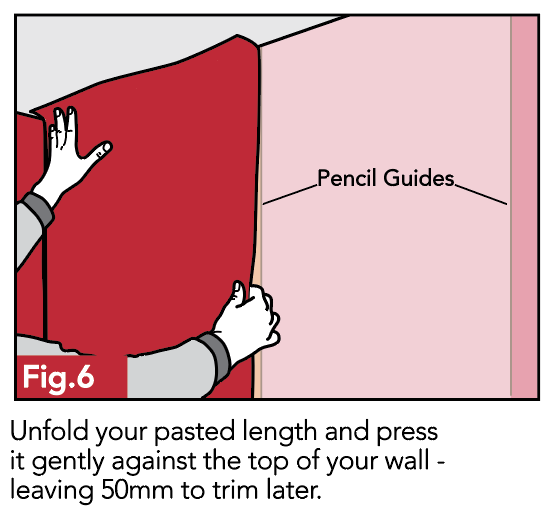 Carefully unfold your pasted length and press it gently against the top of your wall, leaving around 50mm so you can trim it later (fig.6). 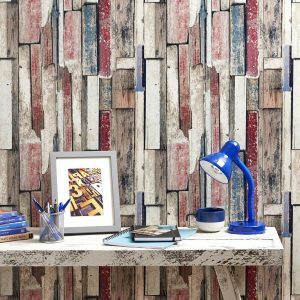 Then use a papering brush to smooth the paper into place and get rid of any air bubbles – making sure it lines up with your vertical lines. Use a brush to gently tap your paper into place where the ceiling and skirting meets your wall. Then use the back of a pair of scissors to score a line down the corner of the paper. 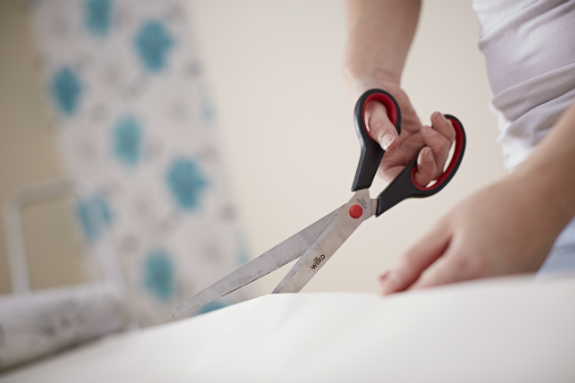 After that, just ease the paper away from the wall and use your scissors to trim the excess. 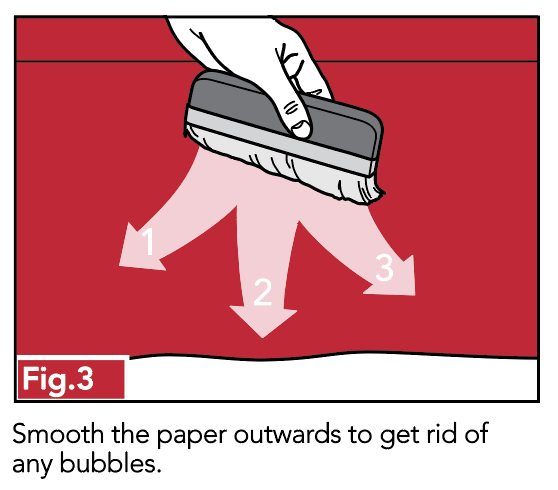 Finally, smooth the paper back into place with your papering brush. Loosely hang each remaining length of paper from the top of the wall placing each edge-to-edge with the previous one without any overlap – making sure the pattern matches before you smooth it down. Paper into the corner and leave a 20mm overlap around the angle. Don’t try and use a whole width to paper around a corner because if it isn’t completely square the paper will hang crookedly. First things first – make sure you switch off your electricity at the mains. Hang your wallpaper as normal, them make diagonal cuts from the centre of the switch or socket. Trim off any wastes leaving 6mm excess. Loosen the screws holding the switch or socket just enough so you can tuck the paper underneath it. Tighten the screws and wait for the paper to dry before you put the power back on. Hang your wallpaper from the top of the wall and smooth it down to the top of the door. Use a pair of scissors to cut diagonally into the corner of the top of the door and push the paper into the angle between this and the wall. 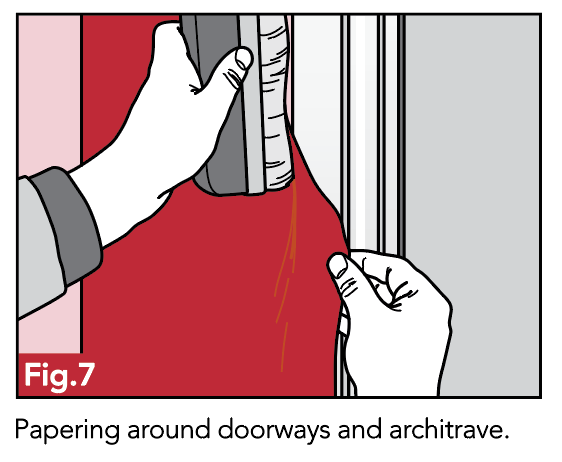 Use the scissors to score along the top of the door then ease the paper off the wall and trim the excess (fig.7). The top of your windows can be treated in the same way as the top of your door. 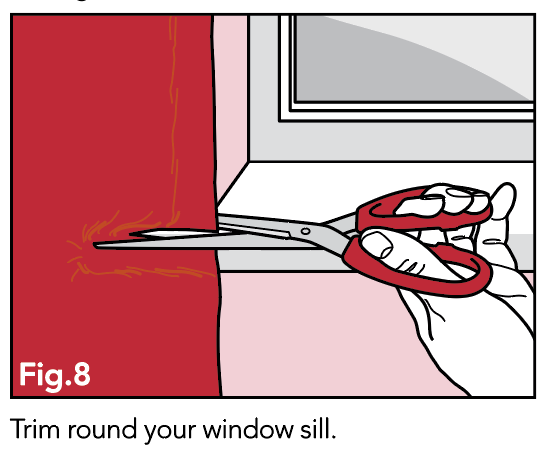 To trim around your windowsill, make a horizontal cut along the top of the sill. Then cut diagonally into the bottom corner of the sill. Feel for the end of the sill and make cuts up to this line (fig.8). Use a brush to push your paper into the angles made by the wall and the sill. Finally, score and trim the waste as with doorways. Cut a width of wallpaper the same depth as your reveal, plus an extra 50mm (fig.9). Then paste and fold it, but don’t put it up yet. Take another piece of pasted paper and place it up against the last full width of paper you put up. Then use a pencil to mark the edge of this piece along the edge of the reveal. Then put to one side. Take your first piece and smooth onto the reveal, being careful to line it up with your pencil mark. Then cut through the corner of the overlap. Carefully tear 25mm off the overlap and then use a brush to flatten it around the corners. 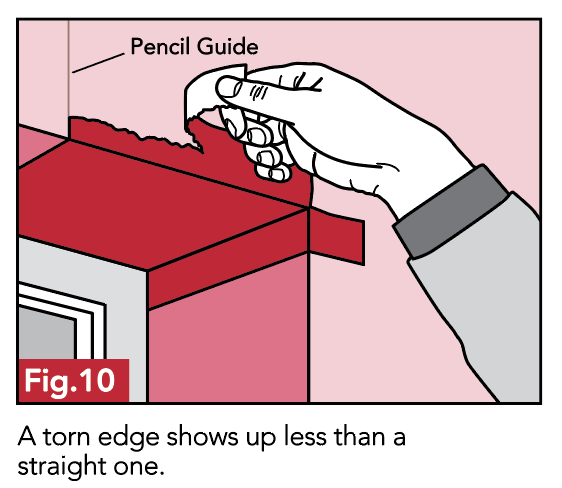 The torn edge will not show up as much as a straight one (fig.10). Finally, hang your saved full piece, making a horizontal cut where it hangs over the opening. Fold the overlap into the reveal up to your window frame, the score and trim any excess. For a downloadable guide to hanging wallpaper, check out our how to hang wallpaper blog. Visit our decorating & DIY department at wilko.com to shop our huge range of wallpaper.